Omaha’s commercial single-stream recycling program is, for the most part, going away. First Star Recycling, the materials recovery facility that handles the vast majority of the Omaha area’s recycling, started sharing in early May that they will no longer accept single-stream recycling from commercial customers as of June 1. Instead, going forward, two streams will be allowed: fibers (cardboard/papers) and plastics/metal/aluminum. If you are a commercial customer that has a single-stream recycling program, you will likely be affected. Let’s back up for just a minute. Over a decade ago, the City of Omaha brought single-stream recycling to Omaha. Single-stream means that basically all of your typical recyclables can go into one container at the source (e.g., your office) and be sorted at a materials recovery facility (MRF). Once sorted, that MRF bundles and sells those materials to end-markets that recycle them into new products. Single-stream recycling makes it much easier to recycle, but it also often results in contamination of the materials. Think residual soda from your Coke can that finds its way onto all the paper that’s in the same bin. The end result of that contamination is a decrease in the wholesale market price for those materials, or, worse, a lot so contaminated that it all must go to the landfill. In other words, the cleaner the materials, the more valuable they are. And in a market that’s been increasingly difficult ever since the 2008 recession and getting more challenging as a result of China’s National Sword policy, every little bit of contamination makes a difference. We’ve spent the better part of the last few weeks talking to haulers, our customers, other recycling facilities, and to First Star to get more clarity on the situation, and we feel compelled to do what we can to get this information out to the public. What we know is that effective June 1 First Star’s commercial recycling is transitioning to two streams: 1) cardboard and paper, and 2) plastics and metal/aluminum. Additionally, recyclables cannot be in plastic bags, which means custodial crews must put loose materials into the dumpster/compactor. There may be exceptions to the cessation of commercial single-stream for some customers. As an example, universities with on-campus housing have some recycling streams that are similar to residential streams, and they may be allowed to continue with single-stream recycling. First Star’s hope is that separating plastic and metal/aluminum from fibers will result in two cleaner streams. While dual streams may create a lower overall diversion rate than single stream systems, some research suggests that dual streams have kept contamination rates down and may create clearer guidelines for the consumer. We have been exploring other MRFs as alternatives. A relatively new one is called Nebraskaland Recycling. 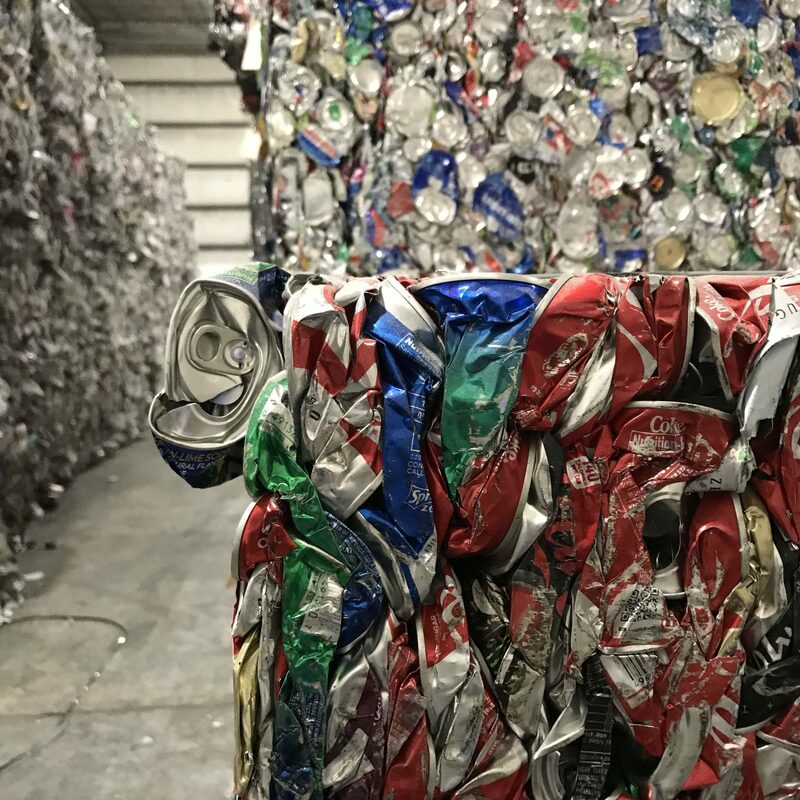 They accept single-stream recyclables primarily to obtain the cardboard, but they hand sort out all of the other materials (e.g., plastics and metal/aluminum) and send the vast majority to the landfill, regardless of whether or not they are contaminated. There are bigger issues here to unpack, but we’ll save that for another time! Other small MRFs exist, but we are not entirely familiar with their sorting systems or processes. First Star’s communication strategy for this large and quick change consisted of a letter sent to haulers and several individual meetings with large customers. It is now the haulers’ responsibility to notify all of their customers of these changes before the June 1 deadline. The tight timing and limited communication (on the part of all involved) present challenges. For a large customer to switch their entire waste management system from single-stream to dual-stream likely means a sizable investment in extra recycling bins and new signage, which can be expensive and require retraining of all staff and visitors. We’ve been sprinting to learn what’s planned, explore options, map out alternatives, recommend paths forward, and assist with the execution of those plans. We’re already brainstorming a much bigger educational and engagement program using Community Based Social Marketing (CBSM) strategies to ensure the public does a better job of keeping contamination out of their recycling. We’re working on a similar project in Lincoln, NE now. The reality is that all organizations need to do a better job of eliminating contamination in recycling streams. We all want to recycle as much as possible, but the priority should always be keeping as many materials as possible out of the landfill by sending clean, high-quality recyclables to every MRF. But our CBSM program is the long play. In the short term, we’re helping customers figure out what to do. If your organization needs a little guidance, give us a call. We can help. Note that the residential single-stream recycling system is going to continue as is with no plans to change. Somewhat surprisingly, residential recycling is much cleaner than commercial recycling.